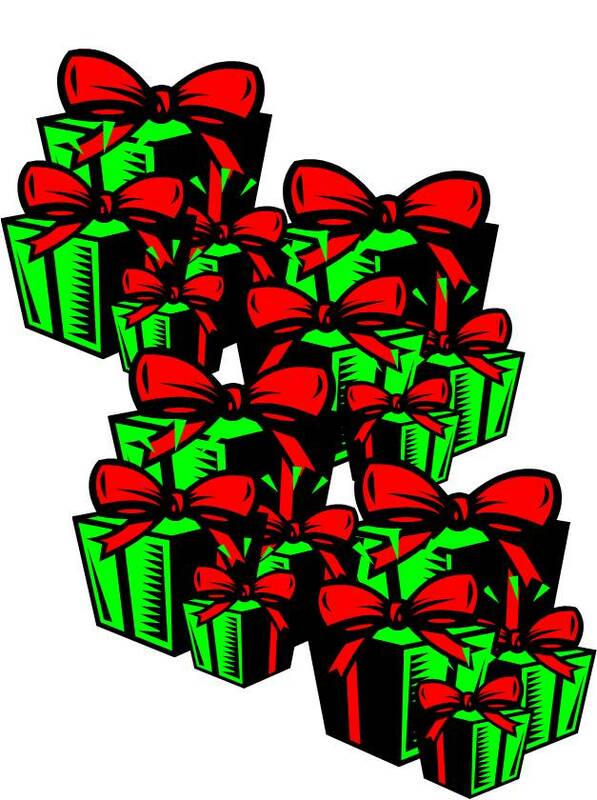 Have you ever wondered just how much it would cost if your true love decided to send you the gifts mentioned in “The 12 Days of Christmas?” Maybe not. But I wonder about strange things like that. First off, you’d be getting a total of 364 gifts. Well, that’s not counting the eggs the six geese laid, the cows the maids were milking, the pipes the pipers were piping or the drums the drummers were drumming. We’ll just consider that it’s a package deal and count those type presents as a unit. It might be a good thing to consider where you live. If you don’t have a place you’d better find somewhere with a barn or an aviary or even a bird sanctuary. You are going to get about 224 animals! Most of them are birds. There will be 12 partridges, 22 turtle doves, 30 French hens, 36 calling birds, 42 geese, 42 swans and 8 cows. If you have a true love who is an environmentalist you might get 40 pheasants (golden ring neck) instead of real golden rings. That will up your total to 264 stinking animals! It would be a good idea to have a couple of spare bedrooms as well. You’ll be having a lot of company. The milk maids, there will be 40, the 36 dancing ladies, the 30 leaping lords and the musicians, the 22 pipers and the 12 drummers will be needing a place to stay. You’ll probably need an extra pantry as well to hold all the food needed to feed the group. Now, back to my business ponderings…how much is this fiasco going to cost? According to http://content.pncmc.com/live/pnc/microsite/CPI/2010/index.html#/book, the total price in 2010 will be $23,439.38. 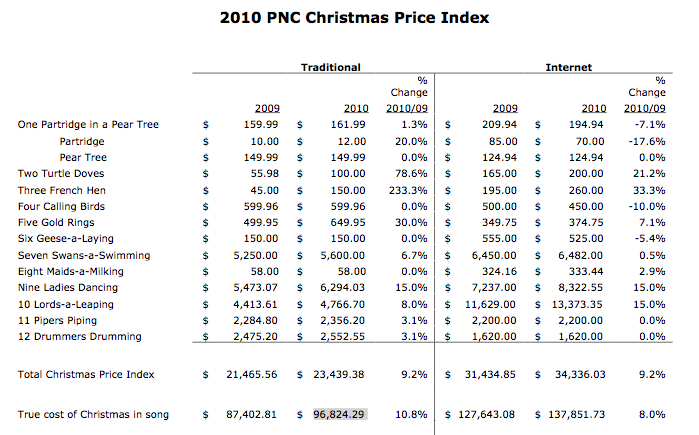 The chief economist at PNC decided to figure out how much it would cost to buy each of the gifts in the song. He didn’t know it but he’s started an economic tradition. 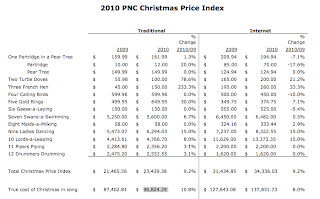 It’s now called “The Christmas Price Index” and it’s in the twenty-seventh year. The price of each of the 78 gifts in the song is added together to get the total cost of Christmas. Wait, each of the 78 gifts? That’s only the total of the gifts given each day. But in reality the gifts are multiplied because you’re going to get the same thing over and over. Oh my! Who put math in Christmas!!? After all the multiplication and adding, the true cost of Christmas this year is $96,824.29. It’s the most expensive year in the 27 year history of the index and is up 9.2% from last year. If your true love were to give you all of this for Christmas, you would certainly feel special. And most likely you’d make the headlines of the local, if not national papers. Then you might make headlines again as you went stark raving mad trying to take care of or get rid of all that mess! 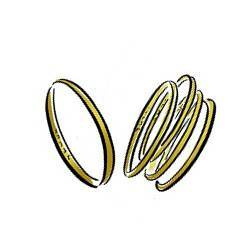 As for me, I think I’ll just take the 40 gold rings, keep one or two and trade the others in for something I really want. Knitayear is going on…for the 250th day! December 6 was a somewhat boring day. I hosted a workshop and it was good but when I was trying to follow my computer hung up. It was fast paced so I never caught up. I stayed in there but just had to kind of sit and play like I was interested. I picked a fuzzy blue yarn. Kind of a good, steady color! Day 251, Dec ember 7, was a day spent trying to renew the debit card, take care of canceling the other card and getting a new driver’s license. It’s a frustrating experience. But I did make it! I chose purple eyelash yarn. Purple makes me feel like I accomplished something and in reality, I did. Day 252, December 8, I was feeling a bit rebellious. I went to eat with a friend and we had a good time. Then I got the chance to leave work early so I took it! The highlight of my day was my Secret Santa package from my LSSK group. It’s an online knitting group where I’ve made many friends, silly as that might sound. Anyway, I got a great package! There were two skeins of Mini Mochi in a beautiful green and purple colorway, one skein of Rittratto in a vibrant hot pink with different color sparkles, note cards with my initial, purple stitch markers, a tin that says Merry Christmas full of chocolate goodies and the cutest tissues ever! She even included pattern suggestions for the yarn she gave me! It was the best package ever and I sure needed it today. I picked the hot pink Rittratto to add in. It’s pretty and it sure brightened up my day! December 9, day 253 I was assiduous (how do you like that word!) and got a lot of things crossed off the to-do list. That always feels good. I chose a Homespun in an off white with multicolor throughout. The countdown to the holiday is on and I’m running out of time and starting to panic. Deep breaths…it will all come about, like it always does. I hope! Ha! I hadn't seen the price index before - love it! @Pam...I know what you mean! Could you imagine all of those nasty birds coming to your house?!? @Miss Bee...I've been checking it for a few years. Kind of interesting!